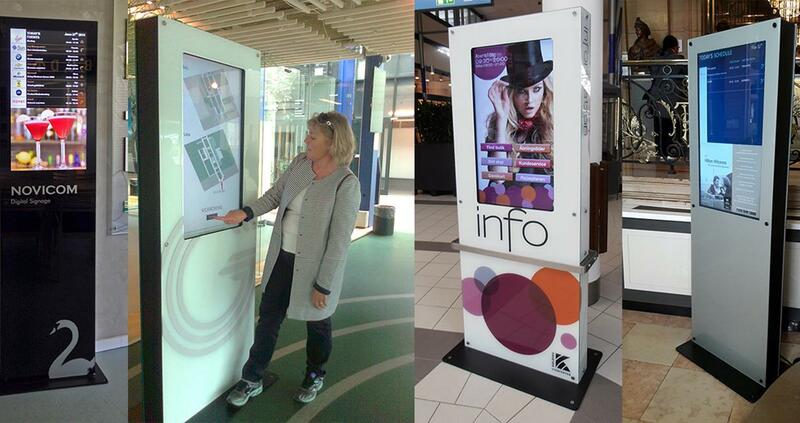 Digital Signage - We provide innovative ways of communication. Our area of expertise is digital signage and we have developed our own user-friendly software as well as designed state of the art screens designated to our customers for use on walls, as stand-alone or in elevators. The key to our success lies in an uncompromising focus on design, high quality, flexibility and the ability to think differently and to provide outstanding customer service. At Novicom we want our customers to have a great experience and to help their business grow when using our solutions. We can assist with everything from the project phase and implementation to hosting. Another focus area is our after-sale service with web training of the customers’ new employees, providing a skilled hotline service as well as regular updates of the software to ensure that we continue to be among the leading suppliers within our business. Novicom designs digital signage solutions for virtually any purpose and industries worldwide. We help you to promote your messages - and your guests to find their way. Our digital sign solution(s) can include everything from a single screen to several hundred. From a small info screen on the wall outside the meeting room and an interactive Wayfinder in the mall to giant outdoor screens for the sports arena. No solution is too small - or too large. The design you choose yourself. Our solutions are based on a simple and clean Scandinavian design that can easily be customized in shape, color and graphics to match your design requirements.